Paul Trewehla, a political activist jailed by the apartheid regime, analyses the role of Iqbal Surve, Executive Chairman of Independent Media. He also exposes the role of University of Cape Town lecturers in this campaign. 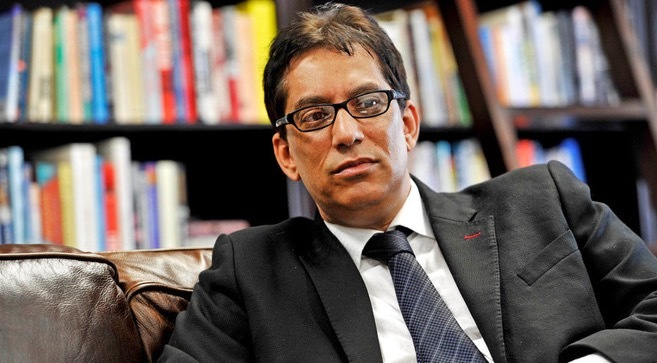 Executive Chairman of Independent Media and Sekunjalo Investment Holdings Dr Iqbal Surve appears to be planning to use an “anti-racism” campaign, recently launched by Independent Media, Sekunjalo and SACTWU, to smear critics as “racist”. This emerged from an exchange between Dr Surve and Dr Mills Soko, an Associate Professor at the University of Cape Town’s Graduate School of Business, on the latter’s Facebook page. Those who Dr Surve apparently plans to “expose” as “closet racists” include editor of BizNews, Alec Hogg, Politicsweb editor James Myburgh, and regular Politicsweb contributor RW Johnson. This follows Politicsweb’s publication late last year of an article by Myburgh on Independent Media which documented for the first time the full extent of the Public Investment Corporation’s financial involvement in the purchase of the group from its Irish owners in August 2013. The article questioned how the group would be able to pay back the loan extended by the Government Employees Pension Fund to help fund the purchase given the continued decline in core circulation of most of its titles, or how it could exert editorial independence from government given its reported R896m debt to the GEPF. The article was subsequently re-posted on BizNews by Alec Hogg. Hogg noted in his introduction that insider talk, at the time, was that the price paid by the Sekunjalo consortium was double what the group was really worth. More recently RW Johnson also commented critically on the ANC’s failed efforts to buy influence through The New Age and the Independent Media purchase. It is time we assert our right to dignity as black South Africans. Alec Hogg, R.W Johnson, James Myburgh and many others need to be exposed as closet racists with a right wing economic agenda to preserve the white economic and political status quo. Independent has today launched a campaign to expose and name and shame such racists. i expect them to write some more nasty articles now about Independent to protect there (sic) right wing hedgemony (sic);. Iqbal my brother, I applaud you on this important initiative to use Independent Media to combat racism in our country. You and I have come a long way and there are some issues on which we agree and some on which we disagree. But there’s one issue on which we passionately agree: the cancer of persistent white racism in South Africa and the threat is poses to the future of our country. I am available to work with you and your newspaper group to fight racism in South Africa. Through our collective efforts we will ensure that all our platforms, titles and our voices are used to engage in education, action, and debate on how to end racism and white privilege. 2016 must be the year in which we stop just the talk and act against racism. While it is difficult to legislate behaviour change, the battle against racism starts with each one of us. We need to ensure zero tolerance for racist behaviour and create an enabling environment that will engender a non-racial, more inclusive and just South Africa. As of the time of publication a request to Dr Surve’s office for comment had gone unanswered. It will be published if and when it comes through. 2015 was an eventful year for South Africa, culminating in two further credit downgrades and the pantomime of three finance ministers in a week which saw a further downward spiral in the currency. This latter development seems to have awoken at least a few members of the ANC leadership to the fact that they are shuffling to the edge of a precipice, though most of the party continues to sleepwalk on. The prospects for 2016 are particularly difficult to assess because we have yet to see the aftershocks of this last crisis. With many commentators now believing that a final downgrade to junkbond status is all but inevitable one must expect continuing outflows of both capital and skills. Immediately, of course, we may see interest rate hikes in order to stabilize the Rand and then, presumably, a tough budget. But how tough? Pravin Gordhan was a fairly complaisant figure in his first iteration as finance minister and allowed the downward slide in the Rand and the country’s credit ratings to continue unabated. No doubt he does not wish to see a further credit downgrade on his watch as minister but it remains to be seen whether he will really be willing to take the sort of actions required to stop it. To take but one example, that of SAA. Gordhan has been applauded for preventing Dudu Myeni’s highly suspect plan to interpose a shadowy and wholly unnecessary middle man into a proposed aeroplane leasing deal. Certainly, in other parastatals such deals have been synonymous with corrupt kickbacks. But the fact remains that SAA will run a deficit of around R5bn again this year, a debt which the state cannot afford but will have to pick up. If Gordhan is serious he has to replace the entire SAA board, Myeni included, and instruct the new (and more professional) board that it must at least break even in future. Gordhan is effectively unsackable and thus easily has the power to do this. If he doesn’t do it, we will know that he is merely going through the motions. There is also the still urgent problem of Eskom. Estimates of the amount required for its re-capitalisation vary from R50 billion to R500 billion and there is no clear way in which the government can afford even the smaller figure. So will that mean large new increases in electricity prices ? Last year industry got together to convince government that such an increase would be simply unsustainable. Things will have got no easier by 2016 – and there is now also the question of the R134 billion required to “green” Eskom’s existing coal-fired stations in line with the COP 21 climate change treaty that the government has just signed in Paris. It would appear that the government signed this treaty in the same blithe spirit that it earlier accepted the International Criminal Court. In practise it has decided that, whatever the Constitution says, it now doesn’t like the ICC, let alone its duty to hand over human rights transgressors. However, the government is also backing away from formally renouncing its ICC membership, so in practise it has decided to remain a signatory to the Court but to disregard the obligations it thus incurs, that is a deliberate choice of illegality. In the same way, it has probably signed the climate change treaty with every intention of ignoring it. Theoretically, Eskom is bound to observe COP 21 under pain of criminal prosecution but, again, one may be sure that the law will be ignored. The odd thing is that the government seems not to realise that this deliberate disregard for international treaties completely undermines its bid for an enhanced position on the UN Security Council and other international bodies. The questions relating to SAA, Eskom and other parastatalswill find their own empirical answers before long. More difficult to estimate is the government’s likely response to the drought and the consequent maize shortage, variously estimated at between 3 and 10 million tons. The first question is will the government extend emergency relief to the farmers ? If they don’t then many farmers will simply go out of business, creating further shortages into the indefinite future. But is this government really going to find the cash to extend cheap credit to white commercial farmers ? Then again, maize is not only a food staple but sits at the bottom of the food chain in many other respects – in its use as cattle-feed, for example. The result is that a maize shortage is likely to trigger increases in a wide range of food prices, with major potential consequences for social unrest in the cities. This could occur during the heightened tension of the run-up to the local elections, creating a sort of perfect storm. There are, too, questions about the ability of the transport infrastructure to cope with large-scale maize imports. But, assuming these can be overcome, how will that maize be distributed? If it is simply sold to the highest bidder, expect trouble from those priced out of the market. If, on the other hand, it is to be sold at a subsidized rate or even given away free, how will this be done? Under similar circumstances in Zimbabwe food aid has been reserved for those who carry a Zanu-PF card. Will the ANC be tempted to play a similar game in the run-up to the elections? If so, then again, expect trouble: South African urban-dwellers are not willing to be treated like Zimbabwean peasants. Here too, we will get empirical answers before long. It is, on the other hand, easier to discern other movements within the body politic. First, one may safely predict that those who, like Allister Sparks, frantically demand the immediate ejection of Zuma will be disappointed. Indeed, to make such demands is merely to show that one has not understood the basics. Zuma has a cast-iron majority at any ANC conference thanks to the great voting blocs of Mpumalanga, Free State, North West and KwaZulu-Natal. Also, as Gareth van Onselen has shown, some 85% of the ANC national executive derive their income from public sector positions within the President’s gift, a fact which makes a vote of no confidence in him at the NEC effectively impossible. Having over-turned a sitting President, Zuma has made sure that the same cannot happen to him. Beyond that, of course, the ANC’s image of authority is the traditional chieftaincy: indeed, it is difficult to see how it could be anything else. What that means is that ANC members are expected to show deference to the leader simply because he is the chief. This model of authority was obvious from the first moment that praise singers preceded Mandela on all state occasions and from the virtual worship of Mandela which ensued. It was on show again in the way that Mbeki was allowed to kill over 300,000 African women and children by depriving them of ARVs – without any ANC leader daring to disagree publicly with this genocidal policy. It is on show again now in the general rallying around “Number One” and the way in which ANC spokespersons have been dispatched to tell flagrant lies in his defence. Hence the remarkable claim by Lindiwe Zulu – doubtless reflecting a more general opinion within the Zuma camp – that local businessmen had manipulated the markets in order to force Zuma to backtrack after Nene’s sacking. It is hard to imagine that anyone could think such a thing to be even possible. It is true, of course, that most ANC cadres have little idea of how a decision like Zuma’s triggers “the thundering electronic herd” to mark South Africa’s currency, shares and bonds down within seconds. It is tempting, indeed, to compare Ms Zulu’s statement with the action of the KwaZulu-Natal MEC Ms Nomusa Dube who, concerned by recent deaths in the province due to lightning strikes, suggested a commission of enquiry “into the cause of the lightning”. However, one should realise that in a party built around the notion of the leader as traditional chief, a blow to the chief’s credibility is simply impermissible. The very notion that the chief’s authority has been weakened is, moreover, deeply threatening to clients (like Ms Zulu) who depend entirely on his continuing patronage. Such clients do not wish to be told that their patron’s authority has been undermined by the impersonal forces of the international market: they want personal villains to blame, and local ones at that. Another such client, Ace Magashule, premier of the Free State, was loudly insistent that Zuma should be accorded exactly the same respect as Mandela. The ANC has always had a high paranoia count but this is notably increasing as the country’s sour mood inevitably reacts on government like an oxidation process causing a metal to rust. In such a climate almost any movement within civil society is likely to take an anti-government turn fairly quickly. Thus Iqbal Surve’s Cape Times deliberately fomented the original Rhodes Must Fall movement as a way of embarrassing DA-led Cape Town but this quickly transmuted into Fees Must Fall, clearly targeted against government, and then into Zuma Must Fall. This is more or less inevitable. Any government which, after 21 or 22 years in power, presides over low growth, record unemployment and institutional breakdown, simply cannot avoid accountability. There was once a time when the ANC could count on the support of many NGOs which were little more than ANC fronts, as well as on the fellow-travelling support of many “progressive” intellectuals. Such support has now largely evaporated. The ANC has reacted to this loss by attempting to buy support – through Gupta-TV, the Gupta’s New Age and the purchase of Independent Newspapers – but this is not really working. Far too many copies of these government-friendly papers are either given away free or bought by parastatals and their journalists are, in the main, just paid propagandists. Few watch Gupta-TV and even the SABC channels have been overtaken by e-TV. A party which wishes to exercise hegemony over society needs an intelligentsia to assist in that task and the ANC is now bereft of such folk. All of which contributes to the party’s growing paranoia. The ANC is simply not equipped to face losing: its whole posture has always been of a party that is always gaining, always leading, from one triumph to the next. Now, like any ordinary party, it can see support ebbing away. The result, if you listen to radio phone-in programmes, is ANC cadres talking of how the Opposition, which is bent on nothing less than the shocking objective of regime change, is really just the tool of sinister external forces (for which read “Western imperialism”). This is exactly how Zanu-PF explained the rise of the MDC. What is undoubtedly sinister is the attempt to depict regime change as somehow illegitimate and the attempt to delegitimate the Opposition by suggesting it is not even national but merely foreign stooges. Quite clearly, this form of argumentation could be used to deny power to the Opposition even if it wins an election. However, one can already see – it was strongly present in the student movement, in the continuing RMF agitation and in the language of the EFF – the resurgence of black nationalist themes, even of Black Consciousness. There is a (philosophically incoherent) attempt to suggest that there is such a thing as “whiteness”, even a philosophy of whiteness, though the only apparent function of this poor man’s theory is to dangle a red rag before the bull so that angry young blacks can mobilize against “whiteness”. For example, a vice chancellor who says he would love to appoint more black academics but can’t find enough candidates of sufficient merit would immediately be denounced for speaking the language of whiteness. It is thus a populist rallying call which has the great advantage of being void of any rational content. Typically, however, this is allied to an angry critique of the older generation for having (as in 1976) failed its young by conceding too much to the whites. To a considerable extent this critique has been fed by the ANC’s own propaganda. Ever since Mbeki the ANC has continually stooped to straightforward racial nationalism. Secondly, the Left has consistently fed the idea that a chance of a major radical breakthrough was missed in 1994 because of an elite pact with white capital. And finally, the ANC has repeatedly depicted itself as the triumphant victor which defeated apartheid, deliberately omitting the crucial fact that it lost the military struggle and had to rely instead on a negotiated compromise. It is all too easy for young black radicals to read all this as meaning that the ANC leadership won the struggle but corruptly threw away its fruits. Given that this younger generation, squeezed by mass unemployment, has every reason to feel discontent with its lot there is a tendency to dismiss Mandela and all his works and to demand nothing less than the abolition of poverty and inequality. Here too, the ANC has way over-promised so there is a tendency to believe that South Africans can have a Scandinavian social democracy if they simply demand it strongly enough. The strength of this current is in good part a reaction to ANC failure. This current is a lot wider and more general than any particular party’s following, though naturally the EFF is a major beneficiary of it. Indeed, it is already obvious that the various groups to the Left of the ANC – among the students, the SACP, Numsa, Vavi – have lost any chance they might once have had of constituting their own autonomous movement. The realpolitik choice they face is to join the EFF or close up shop. Reportedly, DA polls suggest that the EFF has doubled its support from 6% to 12%. If this is so, some of the extra support will doubtless result from the EFF making further progress in the provinces they barely contested in 2014, the Western Cape and KwaZulu-Natal, but such an increase would also suggest that EFF support in Johannesburg and Pretoria is probably now in the 15%-20% range. It remains to be seen, of course, how well the EFF can organize itself for the local elections, find good candidates, put on foot ward and city organizations, and register and mobilize its electorate. The party will also need to come up with a platform for the metropoles – there is no sense in talking about land reform or nationalization of industry in municipal contests where such issues do not apply. And, critically, there is the issue of leadership. There is no doubt that the EFF revolves around the magnetic personality of Malema. Will he run as the EFF’s mayoral candidate for Jo’burg or Pretoria ? Does he want to start building an urban base now that his rural base in Limpopo has been destroyed ? But he can’t run everywhere so this is also the chance tor the EFF to grow a leadership beyond just Malema. Ironically, the EFF’s apparent gains are good news for the DA for they could be the key mechanism which pushes the ANC below 50% and thus allows DA-led coalitions to take power. For example, in 2011 the ANC won 58.5% of the vote in Jo’burg and the DA 34.6%. Even if the DA were to advance to 40% it would still need the EFF to take well over 10% to deprive the ANC of its majority and provide the basis for an alternative coalition. In fact it might even be good enough for the DA to stand still provided the EFF can do well enough. But the DA will clearly need to do a lot of work to explain to its own electorate the logic behind DA coalitions with the EFF. This is another reason why the local elections will be a major test for the DA leader, Mmusi Maimane, who has yet really to impose himself on either the party or public opinion. In part this is due to Helen Zille’s mis-managed decision to force a black leader – any black leader – onto the party. She tried hard to impose both Lindiwe Mazibuko and Mamphela Ramphele. When they both blew up in her face she turned to Maimane. This had the effect of making him seem to be just A.N. Other black man and also the “tame” option, Helen Zille’s creature, as it were. It is doubtful if Maimane can overcome this handicap unless he can visibly “overcome” Zille. The only obvious way of doing that would be to deprive her of the Western Cape premiership – and that is not going to happen before the local elections. However unfairly, Zille’s mismanagement is bound to mean that Maimane will be labelled as the white madam’s “boy” by his opponents. It remains to be seen whether a black DA leader can win any more black votes. On top of that, however, Maimane will need to reinforce his standing as leader of the Opposition. For most of 2015 it was mainly Malema who made the news, with Maimane trailing somewhat insipidly behind. Although DA-EFF coalitions seem inevitable, it will be vital for the DA that they are seen as the senior partner, rallying the smaller parties round it in an anti-ANC alliance – but for this to work Maimane needs to strengthen considerably his public standing vis a vis Malema. What is clear is that the South African polity is now unmoored. For a long time after 1994 it appeared that a new ruling orthodoxy had been established around the new Constitution, the mythology of Rainbowism and the cult of Mandela. Inevitably, that orthodoxy enshrined a permanently dominant ANC. Bit by bit this has all come undone. Mbeki banished Rainbowism, Zuma fought Mbeki, showing that there were two alternative ANCs. The Left has unpicked the worship of Mandela and Zuma himself has flouted the Constitution. There are now fewer fixed points and 2016 will show who can best take advantage of this much freer political market. Next Next post: Is the African Union finally flexing its muscles? I’m amazed, I must say. Rarely do I encounter a blog that’s both educative and amusing, and let me tell you, you have hit the nail on the head. The issue is something that too few men and women are speaking intelligently about. Now i’m very happy I found this in my hunt for something relating to this.